Five gallon buckets can often be found for free, but not always. We’ve had a few requests for information about where to buy 5 gallon buckets, especially metal buckets like the one featured in the rocket stove article. In this article I’m going to cover the best options I’ve found for buying 5 gallon buckets. If you would rather hunt for free buckets, we encourage you to look into our sourcing buckets article instead. The cheapest and most common bucket is the plastic variety. There’s many types of these buckets, so make sure to buy the bucket that meets your needs. The 2 most important ways plastic buckets differ are in food safety and in quality. 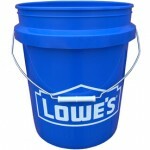 For example, let’s look at 2 popular branded 5 gallon buckets from some home improvement giants. 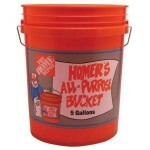 This is easily the United States’ most recognizable 5 gallon bucket. My first five gallon memories are of chucking 2×4 ends into one of these in the corner of our garage workshop. The Home Depot sells these buckets cheap because they have their brand all over them. You can also buy more expensive white unbranded buckets from this company. Note that both of these buckets are utility grade, not technically food grade, so be sure that you do your research before purchasing a bucket for food storage. Read our article on food grade plastics for more information about food safe buckets. If you’re just looking to buy just one or two buckets, it may be best to visit one of the above home improvement giants. One of the downside of buying buckets online is their bulk, which greatly increases shipping costs. However, if you are in need of more premium buckets or a larger quantity, purchasing online is a better option. The buckets I buy are from Great Western Containers, a Canadian plastics manufacturer. I don’t buy them direct from the company, but used from a soap company in town. Many Americans have had good luck with U.S Plastics, which also sells my favorite bucket add-on, the float valve. Amazon.com is now selling buckets with free shipping making them cost about the same as if you bought them in a store, as long as you are willing to buy 10 of them at a time. Some plastic bucket manufacturers advertise on this site, so watch for sales and promotions here. These are much more expensive and harder to find. Steel 5 gallon buckets are not in nearly as common use as plastic ones, but paint stores still use them to sell paint so you may be able to buy one there. (I have asked at my local paint store and they’ve told me no.) Amazon fortunately does now sell steel buckets, but as the sole reviewer points out, you must not use them to store anything water-based. At this point, I need to make an embarrassing confession. I have still not managed to get a steel bucket of my own! So I’m counting on you to tell me if these buckets are compatible with plastic 5 gallon buckets. specifically if they support the excellent screw-on 2-piece 5 gallon bucket Gamma seal lids. If you’ve found a better source to buy buckets, whether plastic steel – or even wood, let us know in the comments. If you’ve found a good source for free buckets, let us know in the sourcing free buckets article. I am trying to help the owner of a very small company increase profits so they can stay in business. They pick up used 5 gallon buckets from a local company who buys product for making soda. The employ somebody to unstack and wash out these buckets by hand and leave them outside upside down to dry. They need to wash about 300 a day during peak season. The buckets only contain food product which is non-hazardous and disolves in water. Great question. I don’t know of any consumer machine that washes buckets automatically.I used to wash around 20 a day, which took maybe 50 minutes – which is approximately in line with your numbers. One fact I have found is that washing buckets becomes easier the higher your water pressure is. Using certain hose attachments, such as something that sprays a cone rather than a straight stream seem to help as well. Perhaps by using a pressure washer with good attachments you could cut an 8 hour wash day to 6 or 4 hours. I’d also consider adding an element of “social engineering” with regard to pay for bucket washing. Is the cleaner in question paid hourly or paid per bucket? I would never pay hourly, it encourages slowness rather than quickness. I believe piece rate is fairer to both the employer and the employee. We used to have buckets washed during wintertime by one of our workers who had an indoor area for washing. He would wash AND dry them at around 50 cents CAD per bucket. The faster and more efficiently he worked, the more he would make. We are a company here in Ghana west Africa who are seriously wanting to make business with you. We want to buy 10000 thousand unwashed buckets with their lids on them. We only need the unwashed ones. Please, treat this as urgency. Hey Maxwell, im looking for about 6 dozens of buckets.please send me an email [email protected],if you still have your buckets. I wash 5 gallon buckets for a living for a small 5-person business that is just scraping by. I am interested in efficiency because I do other important tasks for the company. I’m paid by the hour but push myself to wash buckets at 1 bucket per 3 seconds, but it depends on how dirty the bucket is. I think if you have a good worker, they should be paid hourly for their hard work. If they’re slow or lazy, hire a different worker. Personally, I’d be insulted if I were paid per bucket because it should be assumed I’m working my hardest, plus I don’t think it’s fair to be docked pay if there’s a day where I’m injured or sick and a little slower than usual. Washing buckets for 8 hrs gives you time to brainstorm ways to wash faster…I’ve found that staggering the buckets on top of each other makes it easier to grab and wash (we spray, then wash in dishsoap tub, then dip in bleach tub) rather than having to unstick a wet bucket from a stack. Thanks for the opportunity to share my thoughts about bucket washing! Good idea: secure buckets to a truck flatbed and drive through a carwash. Checked out your site – VERY cool. We do the same sort of thing out in Victoria. Like the idea of using bleach. 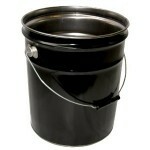 The best price I have found on food grade 90 ml heavy duty 5 gallon buckets is $4.59 per bucket. The Gamma seal lids for $5.99 per lid. They also have an assortment of colors. Here is the site http://www.bayteccontainers.com. Good luck everyone! build a 3 sided wall, stack the pails on their side on top of each other with a board at the back bottom so they tilt forward a little and turn a pressure washer machine on to spray out gunk. Spray soap in and rinse. This can “wash” the bulk of them, and get you to where if you need to wash and sanitize, then it is a matter of just dipping them and then drying. Hi I am looking for free buckets around the north east area to store emergencie food supplies in . Preferably 5 gallon ones with a 12 inch dia to attach gamma lids to them. If any one knows of any where that is throwing away buckets I would greatly appreciate any help thankyou for your time.